I first traveled to Montaña de Luz in 2015 when I had just graduated high school. This was an important time for me when I was transitioning and so my view of the world was changing. My experience at Montaña de Luz has helped shape who I am today. My life has gained a deeper meaning through my connection with others and my relationship with the child I sponsor. When I tell people about Montaña de Luz I want to help break stigmas about life in developing nations. In America we tend to have a negative and sadly one-dimensional view of people “less fortunate” than ourselves. This is wrong. 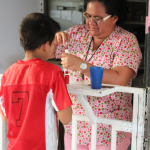 The children at Montaña de Luz are more than a statistic. I have seen them struggle, but I have also seen them dance and laugh and thrive. Going to Montaña de Luz has given me so much perspective on people with lifestyles different from my own and also has shown me the dangers of trying to impose American values and priorities on other countries. My experiences at Montaña de Luz led me to choose Honduran poetry as the focal point for a ten-week research project at Capital University. While working on this project this past summer I returned to Montaña de Luz and it felt like coming home. The profound impact of Montaña de Luz on my life is a testament to the truly amazing people involved. It can be very easy in this time in our society to be bitter and cynical when we see the hurt that exists all over the world. However, significant change comes through significant relationships. The community I’ve been welcomed into with Montaña de Luz gives me hope in a better world. 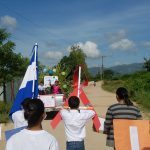 When I see people in the Montaña de Luz family come together for the things like Fiesta or the Walk4Education I get a renewed sense of the important work we are doing. Whether it is from the children, a long term volunteer, a tía or tío, or someone on my service team, there is always something to be gained from this community.